Longtime Democratic presidential wannabe and U.S. Sen. Elizabeth Warren is coming to Colorado next week to hold a pow wow campaign organizing event. 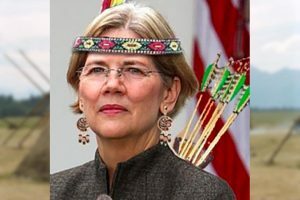 No word yet on whether she will try to identify with western voters by flaunting her Indian ancestry, which she claimed a DNA test proved, but Cherokee Nation logically rebuffed. “Current DNA tests do not even distinguish whether a person’s ancestors were indigenous to North or South America. So if you wish to attend, or protest her continuing charade, the event will be held April 16 at 6:30 p.m. at the Hanger at Stanley in Aurora. That’s the day after tax day, so be sure and ask about her over-zealous spending of taxpayer dollars.